Our organic cocoa powder is made with finest organic cocoa beans. These are harvested at the perfect point of ripeness, then carefully fermented and dried to maximise the smooth, complex flavours or this delicious cocoa. Potassium Carbonate is commonly added to cocoa powder to balance out the acidity and bring out the rich chocolatey aromas. This is often referred to as 'Dutching' and has been used by chocolate makers for over 180 years. # In accordance with legislation, all organic products are free from artificial flavours, colours and preservatives. Store in a dry place., Protect from heat., Best before: see base. 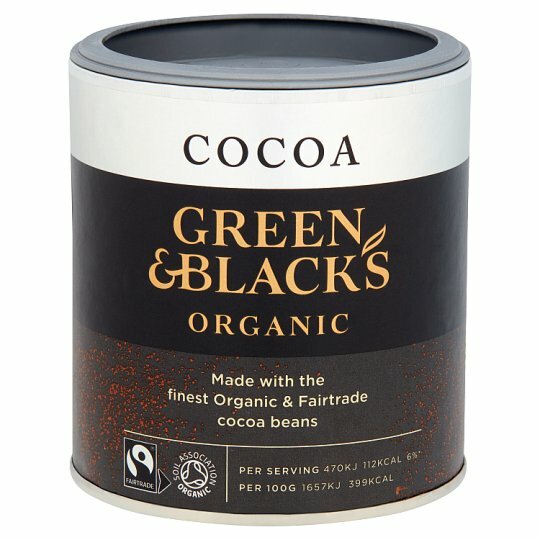 Preparation instructions (with 200 ml semi-skimmed milk): for one cup of cocoa, add one teaspoon (4 g) of cocoa powder with cold milk to make a smooth paste. Add hot milk, just off the boil, and stir well. Sweeten to taste.